Djay lets you easily mix all your tracks and playlists from iTunes - simply drag and drop the songs onto the turntables. You can perform live and record your mixes at home with ease - perfect for beginners and seasoned pros alike. Or you can enable Automix mode and let djay mix your playlists with seamless DJ-style transitions, non-stop and fully automatic. Enjoy beautiful cover art right on the virtual vinyl and smoothly fade one song into the next using a variety of DJ-style transitions like Backspin, Echo and Brake. Put your own voice into the mix, then transform your vocals using Echo or Pitch-Changer effects. Plus you can use the mouse or two-finger gestures on a notebook's trackpad to mix and scratch your songs - no additional hardware required. With full support for all songs purchased from the iTunes Music Store you'll soon be producing killer mixes from your favourite music. Mac OS X 10.6 or later. Changed "Focus Queue" MIDI action to "Toggle Queue"
Note: To play tracks from iTunes Match with djay, please first download them with iTunes by clicking the track's cloud icon, then choose "Refresh" in djay's Library menu. The Sampler is a very powerful tool that allows you to create, play and loop short sound snippets. With these short sound clips, you can either make entirely new music or simply integrate them into the main mix. To create and build your own collection of samples, you can record individually from Turntable 1, 2 or the Microphone. The Sampler has a highly precise recording timing which can be used to extract a particular fraction of a song, similar to how you would use a "trimmer" in audio editing applications. Breathtaking graphics and animations become even more immersive in djay 2.0's new full screen mode. You can optionally show/hide the music library in full screen mode. Let djay be your DJ! With Automix, djay will automatically mix live any iTunes playlist of your choice with amazing transitions. Simply press the Automix button to get the party started! You can also customize Automix to your liking in Preferences. djay 2.0 is the first digital audio player that provides full support for undo and redo. Practically any operation can be instantly undone, even during live playback. You can even use Undo/ Redo as a fun mixing tool to switch between two states. For example, Bass On - Bass Off or skipping the needle back and forth. djay 2.0 allows you to save all slider settings you have made for a song such as EQ, Speed, Balance, Pitch and Gain. You can instantly save the settings for a song without modifying the original sound file and the settings will be applied the next time the song is loaded into djay. You can also save any Cue Points, BPM and Loop region that you created for a song. djay 2.0 offers highly innovative ways of seeking through your sound files to find a precise spot in a song or to analyze a song's structure. djay's iTunes integration has dramatically improved. You can now arrange tracks by Playlist, Artist, Album, Genre and Composer. The tracks table contains a very useful status column that indicates whether a song is currently loaded on a turntable, if it has already been played, and various other information. The new Song Marking feature allows you to visually mark any songs in your library so you can easily find them later during a djay session. The Song Info viewer gives you a detailed overview about each song. djay now allows you to keep track of all the songs you have played during a djay session. You can even export your song history as a playlist to iTunes or save it as a PDF. Put your own voice into your mix, live! You can use the Live Microphone to speak into the mix or sing to the music. Apply echo and a real-time pitch changer to your voice to sound like you've never sounded before. 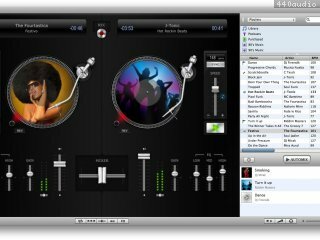 djay 2.0 allows you to automatically and seamlessly switch from one song to the next using a variety of incredible techniques such as Backspin, Echo, Reverse, Brake, Standard, and Random. Looping is a great addition to Cue Points that replays a particular part of a song continuously. You can create loop regions that are as short as 0.1 seconds or as long as the entire duration of an audio file. The djay audio engine has been entirely redesigned. It is characterized by world-class sound quality and industry leading performance. It supports more than 30 different audio formats, including all purchased songs from the iTunes Music Store. 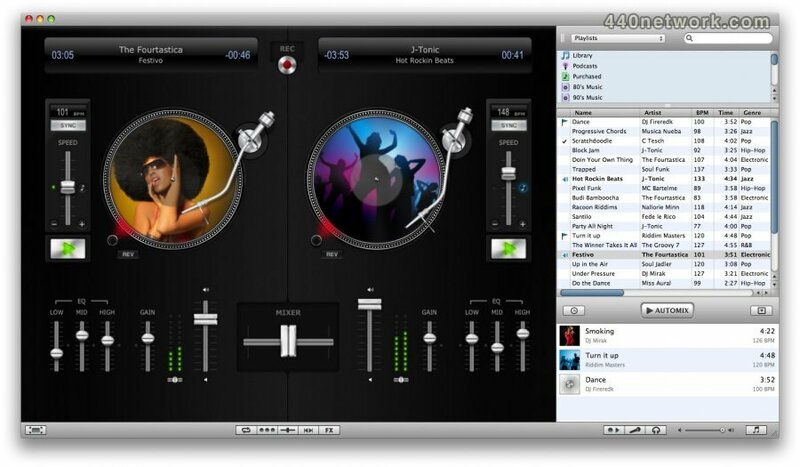 djay 2.0 will even extract the audio content from other media formats such as digital videos or QuickTime movies. Using external audio hardware has never been any easier. Wether you are using a microphones, USB headphones, or a sound card - simply plug them into your Mac and djay will detect and perform the optimal configuration for you automatically. Just excellent!great interface stunning application.....congratulations on the developer! With many entry level DJ apps about this is one of the best. Not only is it a comprehensive app and intuitive interface but it indicates great scope for further developments from an obviously talented development team. Good manual, useful features but not too much flash and great keyboard controllability. Used with iTunes you can easily make up prepared sets or follow the floor. This verges on a professional app for free. Download now, then watch this space. Even better now the app checks for updates.